Not only does Smith.ai integrate with Housecall Pro, but Smith.ai clients also get a special discount on Housecall Pro plans. Housecall Pro is business management software for home services busineses, like carpet cleaners, HVAC technicians, and plumbers. 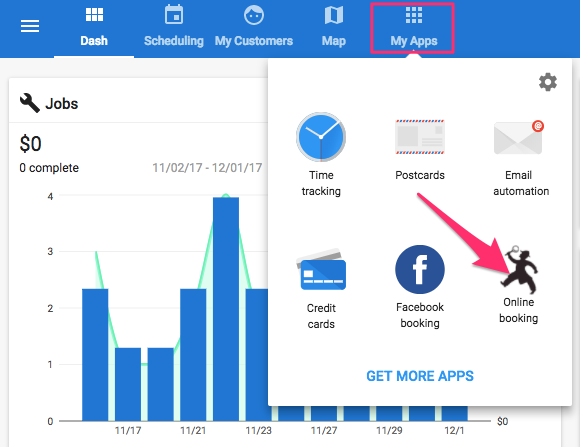 Easily schedule and dispatch members of your team, accept bookings and payments from clients, and create estimates and invoices — right from your phone. How does the Smith.ai and Housecall Pro integration work? If you currently use Housecall Pro, integration means your Smith.ai receptionists will be able to book appointments for new leads and existing clients directly in your account. Login to your Housecall Pro account, click on "My Apps," and then select "Online booking." You will now see your online booking page. Copy the entire URL that appears in the browser. Paste this URL into an email to support@smith.ai with the subject, "Housecall Pro Integration." That's it! Your Smith.ai receptionists will be able to begin booking appointments directly in your Housecall Pro account typically within 1 business day. Please note: Appointment booking and CRM integration are optional add-on services and will incur extra fees. View current pricing for these and all other add-on services. At the time of writing, plans start at $39/month (retail cost) for one user. To take advantage of the discount, sign up at Smith.ai's dedicated partner page at housecallpro.com/smith. If you have questions or need assistance connecting your Smith.ai account to Housecall Pro, please call us at (650) 727-6484 Monday through Friday between 5am – 6pm PT, or reach us by email at support@smith.ai.